If you missed out on our latest webinar, or just want a chance to review (it’s pretty dense with budgeting info) you’re in luck! You can watch the video by simply entering your name and email in the box below. Video continues to be one of the highest engaging formats on my sociel media. It’s certainly something I need to invest more time on. 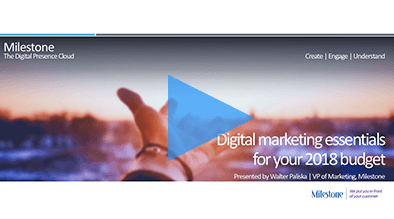 Home Upcoming Webinar: Digital Marketing Essentials for your 2018 Budget – 8/17	How Can You Make The Most Out Of Your Digital Marketing Plan In 2018?